This course discusses design of a watering and pressure relief or groundwater control system. To do this first requires determination of the type of groundwater flow (artesian, gravity, or combined) to be expected and of the type of system that will be required. This course discusses design of a watering and pressure relief or groundwater control system. To do this first requires determination of the type of groundwater flow (artesian, gravity, or combined) to be expected and of the type of system that will be required. Also, a complete picture of the groundwater and the subsurface condition is necessary. Then the number, size, spacing, and penetration of wellpoints or wells and the rate at which the water must be removed to achieve the required groundwater lowering or pressure relief must be determined. Learn how to control surface water. This course is intended for civil and geotechnical engineers and other design and construction professionals interested in dewatering systems for foundations of structures, tunnels and shafts. This course will give professional engineers and construction professionals an introduction to the analysis, systems, equipment, and materials employed in dewatering. 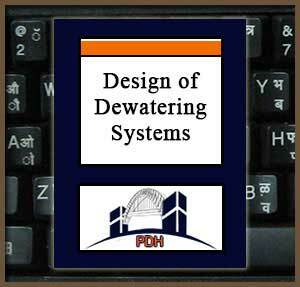 This is an introduction to the analysis, technology and design of dewatering systems. This course will give you an introduction to dewatering analysis and system design.